'Do you actually have a broad 'sword' Dicky?'...... "Oh yes!, just ask Liz"
For almost a year now we've had digital TV, offering a wide range of channels for your viewing pleasure. The main reason I signed up for it was BBC3 and BBC Prime. BBC3 at the time was showing comedies 6 months prior to them being released on terrestrial TV in order to seduce the UK public on to digital. But as it seemed to succeed they are not doing this anymore so BBC3 is now a "oh bugger I missed that and we don't have a HDD in our DVD player so we can catch the repeat on BBC3" channel. BBC Prime on the other hand is a godsend. Gone are the days of watching crappy daytime TV. With Prime you can catch My Family, 2.4 Children, Only Fools and Horses, Casualty repeats every afternoon. My afternoons are no longer fuelled by improving my knowledge of property vaules or how collectable a Two-handled Jubilee Mug is. Along with Hustler tv another channel I Never watch is TCM (Turner Classic Movies) . A movie channel that serves up American crappy movies mostly. But this afternoon they treated us to Where Eagles Dare. 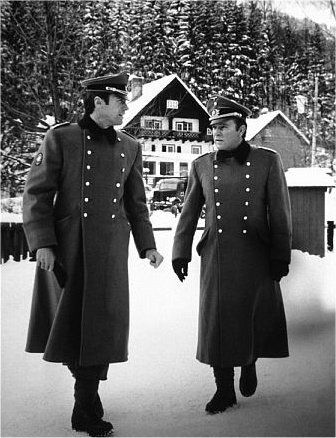 Richard Burton and Clint Eastwood defeating the Germans on their todd. Tomorrow TCM will be treating us to a small independent movie from India titled 'The Crazy Street'. X-Box are rumoured to be making a new game inspired by this short film. Potter to join forces with Malfoy? The Blog of a smog. Stuff about stuff.